The Utah Museum of Fine Arts welcomes visitors of all ages and offers discounted admission for groups of 10–60 visitors. Group tours must be scheduled at least 2 weeks in advance—we recommend scheduling 4–12 weeks in advance as we often receive more requests than we can accommodate. Transportation for public and charter school groups is first come, first served. Fee waivers may be available for groups demonstrating need. Click here to schedule a group visit. You will be contacted within 3 business days to confirm your request. Click here to schedule a group visit. Click here to schedule a pARTners tour for 4th-grade students in the Salt Lake City School District. Guided tours for groups (10–60 visitors) are available by appointment during regular Museum hours, Tuesday through Sunday. Tours typically last one hour and are adapted to the group's interest, specific collections or themes may be requested in advance. Click here to schedule a group visit. Explore the galleries and permanent collection with self-guided tours. Self guides offer suggestions for creative and engaging exploration of works on view. Check them out free of charge at the welcome desk or download from our website, click here for details. Reservations are required for groups of 10 or more to qualify for discounted admission. Scheduling 2 weeks in advance allows us to balance large groups in the galleries and facilitate an enjoyable Museum experience. Click here to schedule a group visit. Traditional, adult-oriented galleries are more fun and accessible for families with a UMFA family backpack. Each pack contains hands-on activities designed for families with children ages 4–12, focused on individual art objects and the cultures they represent. Family backpacks provide a more compelling array of hands-on materials and multisensory activities than traditional paper and pencil family guides. The packs may be checked out at the welcome desk, free of charge with Museum admission. Discover more about the art on view with our free audio guide. Use your own device or borrow one at the welcome desk, click here for download instructions. 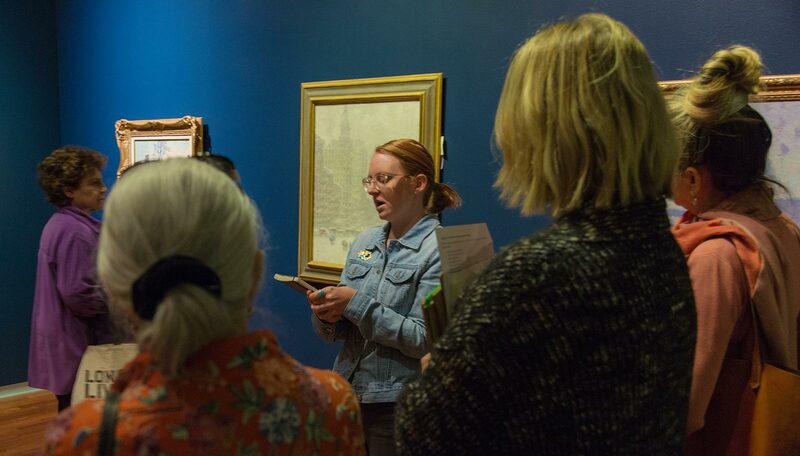 Designed for existing book groups, Art Tours for Book Lovers is an exciting program that unites visual art and literature. After reading a featured work together, the group can visit the Museum for a docent-guided, discussion-based tour related to that specific work. Tours last approximately one hour. Online discussion guides are available for each featured book. Learn more and book an Art Tours for Book Lovers visit here. The UMFA welcomes faculty and students from all higher learning institutions to study objects from our collection. Students from Utah public colleges and universities receive free admission with student ID. Guided tours for college and university groups (up to 60 students) are offered by appointment during open hours, Tuesday–Sunday. Tours typically last one hour and specific collections or themes may be requested in advance. Classes may also visit the museum on a self-guided tour, available by appointment and scheduled at least one week in advance. Click here to schedule a group visit. Classes and individuals are welcome to sketch objects on view in the galleries. For the protection of the art and the Museum building, only dry media such as pencils, chalk, charcoal, and chalk pastels are permitted. Greasy media, pens, markers, ink, and paint are not permitted. Please use a drop cloth or plastic trash bag to collect chalk powder and pencil shavings. If you forget your drop cloth we have a limited supply, check at the welcome desk. Groups of 10 or more should make advanced reservations to avoid conflicts with other tours or special programs. Click here to schedule a group visit.